Often referred to as The Dark Moon, the new moon is present when there is no evidence of the moon in the sky. The new moon ensures new beginnings, new starts and new healthy habits, and it’s also a good time to start new projects and endeavours. Unhelpful and habitual ways of thinking, are also more easily banished or corrected on a New Moon. If you can manage it, working on the first day of the new moon is the best time to start to plan out new projects and ventures. If you want change, good luck, new growth and new beginnings, now is the time. Make yourself comfortable, relax and close your eyes. Focus on breathing deeply in and out, until you start to drift into your own world. As you relax, find yourself on a high cliff, behind you is a huge eyrie, the nest of an eagle. There is a light breeze, clear blue sky above you and the sun is shining. You turn to face the eagle and connect mentally with its unconscious. Ask it to guide you and show you what opportunities are available to you. Feel the air beneath you, feel it whisk around your feathers, glide in the air. Follow the eagle as it soars across the skies. As you fly take a moment to look down, take in the landscape and the scenery as it rushes past. What you see while flying will give you insight into your options and pathways that are available to you. Gradually the eagle leads you back to his eyrie. You land safely on the cliff, full of ideas and plans. At this point the eagle may give you a message. When you are ready, slowly change yourself back from an eagle form to your own shape. Then gradually come back to this reality, stamp your feet and wriggle your fingers. You can burn it, or add to a base oil and use it in other ways too (seek advice from the supplier as to what oils are ok to be inhaled, used on skin, around pets etc.). White, red, silver and pastel colours. Take a couple of pennies and go outside when the sky is dark. Hold the pennies in your hand and ask out loud that your plans be executed and your path be clear. Visualise what you goal is, and state it out loud. Throw the pennies up into the air. Then say out loud that you offer the pennies to the moon and give thanks. Put into a bath and relax while visualising fresh starts, successful projects and new beginnings. Photograph of person involved or something on paper to represent what is involved. Set light to the corner of the photograph or paper and drop it onto the fireproof dish to burn. Watch the flame and visualise all the pain, hurt and anguish you have experience being released from you. Keep visualising the smoke taking away those negative energies. When you are ready, take the sprig of herbs and hold them in your hands, up to your forehead and visualise happy and joyful images replacing the hurtful and negative ones. End by putting the herbs and ashes of the photograph or paper into the pouch or bag. Take it away from your house and bury it. 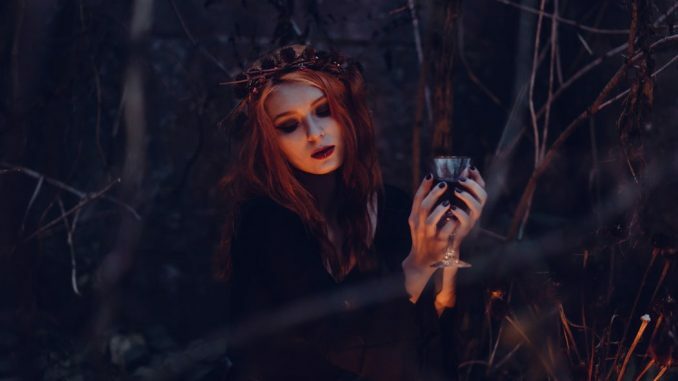 Throughout the period of the dark moon visualise positive outcomes of your plans, work hard to change your unwanted habits, avoid contacting those who you wish to break free from and just watch the magic unfold! Releasing Spell Kit – To release any negative baggage and burdens from your mind, body and spirit. New Beginnings Spell Kit – To aid you onto a new, fresh start in any area of your life. Centering Spell Kit – To bring you back to your center and bring balance and harmony into your life.